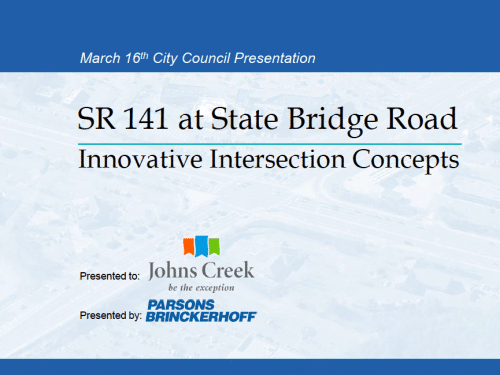 141 / State Bridge Rd Reconfiguration Concepts141 / State Bridge Rd Reconfiguration Concepts. 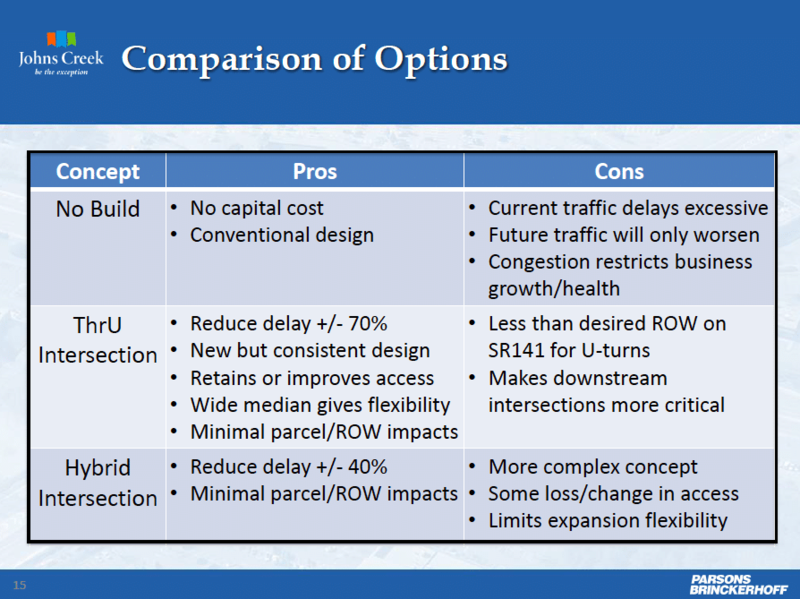 The City Hired Parsons Brinckerhoff for $38k to compile the following presentation of 2 concepts. The First Concept is the ThrU Intersection. 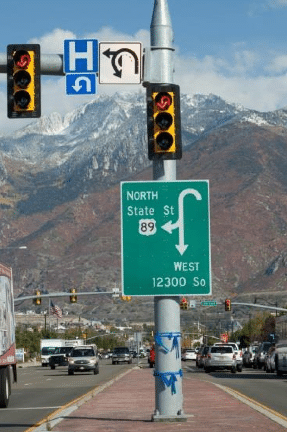 It eliminates Left Turns from the intersection and creates a U-Turn in the Median, for cars to make a right and then U-turn to go instead of a traditional Left. This will have cars enter the intersection twice. 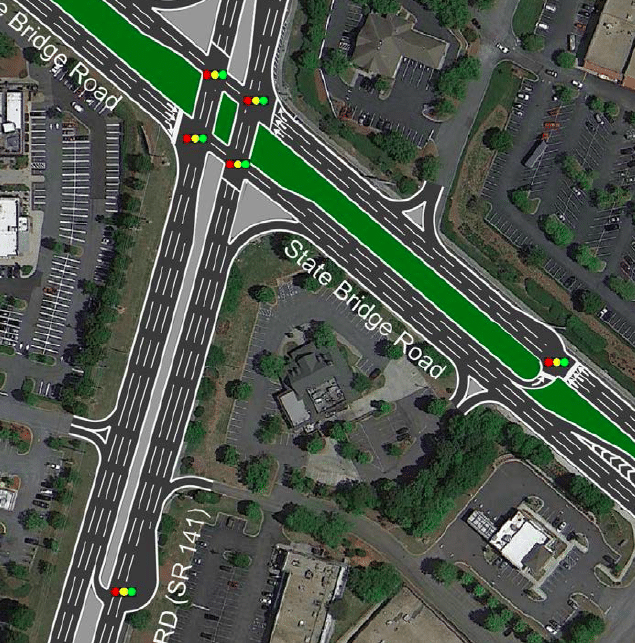 For example: Cars driving from St Ives/Medlock Bridge Subdivision want to go to Target. They will need to make a right at State Bridge, going West. Then make a U-Turn by Pikes and drive straight through the intersection to enter. Another example is the commuters driving North on 141 and need to go West on State Bridge Rd. Currently there is 2 Left Turn lanes (700 feet, 350 feet in length). The proposed U-Turn lane would be a Single of 350 feet in length. Also an additional light would be needed for the westbound traffic to stop to allow for the U-Turns. Logistically, U-Turns are slower to maneuver than Left Turns. They are also more challenging for buses, trucks and emergency vehicles. This concept is proposing a Marginal 12-13% improvement in Capacity. The Wide Ranged Cost is $2-4million. The 2nd Concept Integrated a Continuous Flow Intersection with the ThrU Turn. The proposed capacity improvement for this was even less at 4-6%. Below shows the Comparison and percentages. This study does not address projected population growth within Johns Creek & rapid development in Forsyth County, as well as estimated delay when the proposed intersection reaches capacity and beyond. 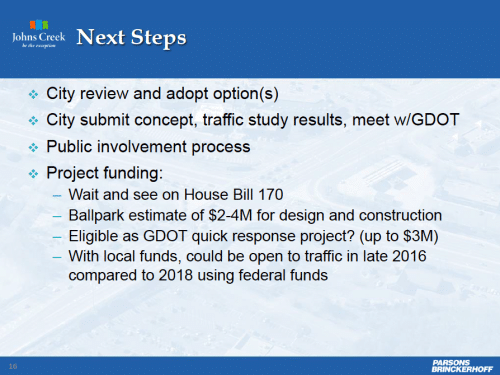 It seems an unusual process for the City Council to adopt options and submit to GDOT, and then have the public involvement process last. It would behoove the City to involve the Public first, before moving forward with the plans. Updated with additional wording in Red. Actually, it’s not unusual to follow that path. This is the way it normally. Is there a reason the Johns Creek Post is trying to circumvent the normal road construction approvals process? I thought the idea behind Johns Creek was to do things differently and involve the public. I would like to make some other suggestions for improvement of safety and flow. I can imagine a tremendous amount of signage is required to direct drivers, which way to go. Here is a link to the VDOT’s information on this turn. The signage will make us wonder why we even worried about billboards. 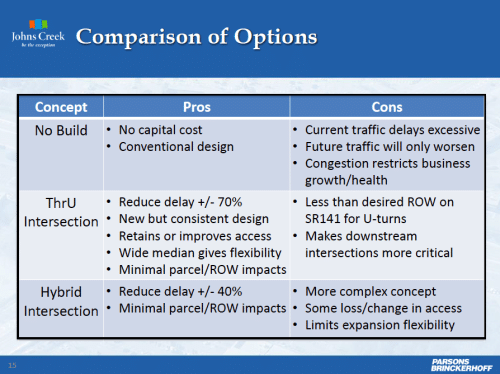 For starters, can we compare the performance of adding a third lane in each direction north and south for both State Bridge and 141 to the Innovative Uturn approach? It was good enough to add a third lane between State Bridge and Old Alabama, wasn’t it? A third lane clearly boost capacity by 50%. The Uturn does not. What will we need to do for the next expansion to volume after this one? If the Uturn approach reaches capacity in one or two years what then? What happens to a Uturn type situation if traffic volumes increase 50% beyond today’s levels? Do they function under back up situations? 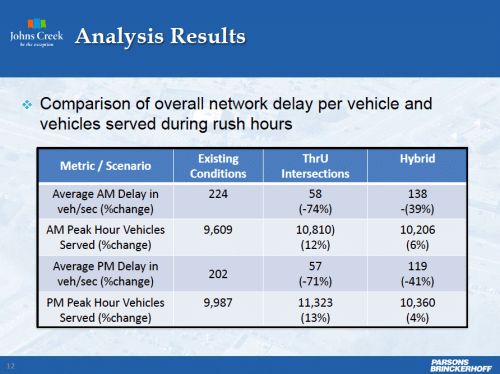 The residents of Johns Creek have suffered with rush hour delays that start at 6:45 am and continue past nine am daily in the am and worse in the PM.. We have suffered long enough. If our long term projections say that this Uturn is a short term solution, then we need a serious discussion on going ahead and doing what needs to be done. 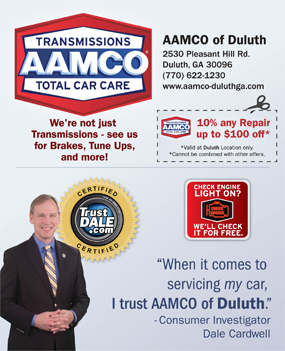 There is a tremendous amount of pent up traffic demand in our community. A partial solution will provide little return on the investment. We need more information with more data presented to us to know what will be the best solution for our needs. And if we are presented with a real solution, I am sure our residents would be willing to support it and whatever it takes. 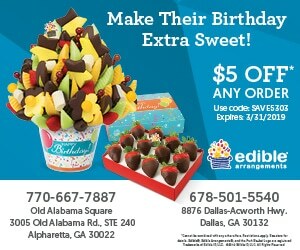 We cannot accept less if Johns Creek wants to remain exceptional. There is no quality of life when you spend 15-20 minutes traveling the last mile home day in and day out. There is a problem when you know not to even try to go the grocery at 6:00 p.m because it will takes so long to get there. So let’s seriously discuss all of our options. But we must have the right questions asked and answered. Another reason that we should have filled the two Council Seats that are currently vacant. Your comments are quite sensible. The right questions must be asked an answered, and having two vacant council seats greatly compromises the checks and balances that should be in place. We’ve updated the post with a few more details in (Red). 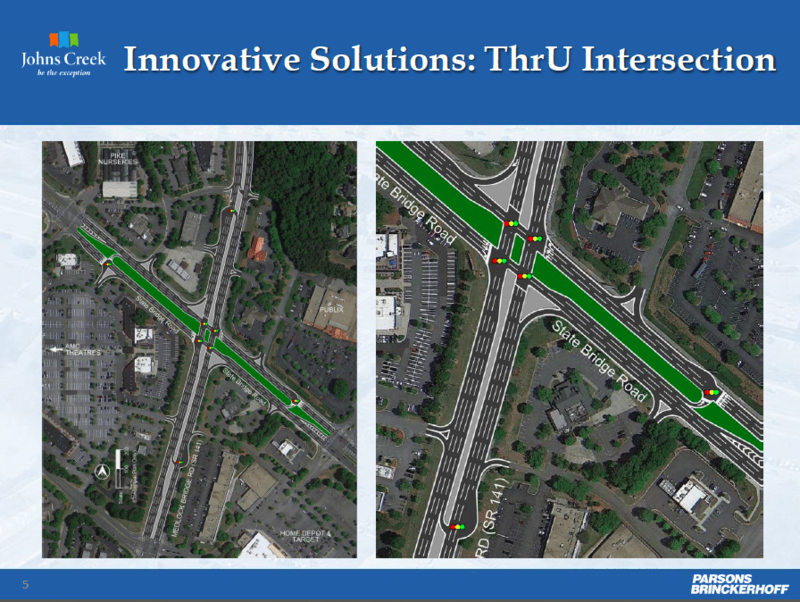 The ThrU intersection concept is proposing a Marginal 12-13% improvement in Capacity. This seems really confusing and I would be concerned when it backs up the u turn folks would be blocked. It sounds like relief but temporary. We need a big solution to solve this. Since the intersection is at top of hill what about the east west tunneling under like Buford highway and state bridge but not quite so highway looking. Or north south.? If you kept the intersection same height and dug down we could keep the character of the city and safely accommodate walkers bikers etc. expensive but Dream big my Friend and solve this problem, you will make up for it in property tax! Included photos of the Signage for these ThrU intersections. Sounds like a lot of taxpayer $$$ to spend on a marginally effective solution. 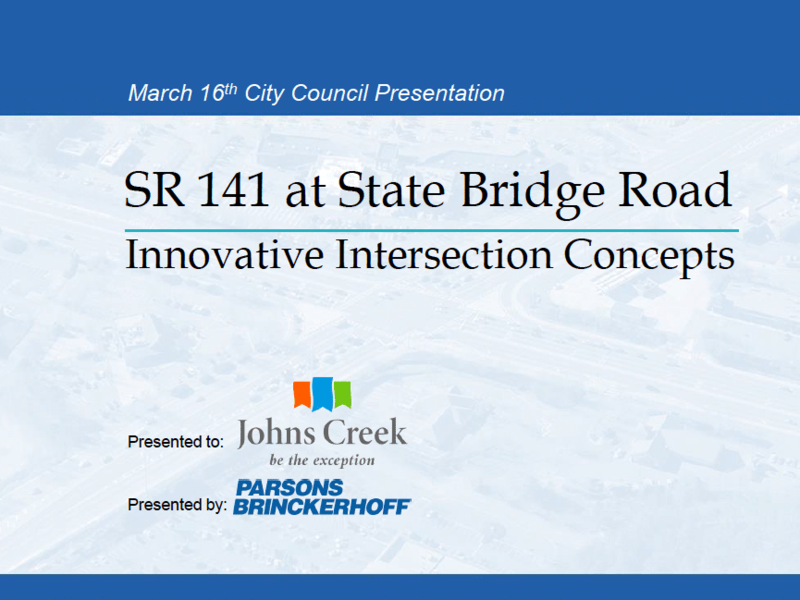 What we don’t need is more months/years of construction out on SR 141. Maybe review traffic signal management and having JCPD directing traffic at school intersections and heavy flow intersections at rush hours. Use existing resources before spending more $$$. The signage is nightmare and concept confusing; this is not a simple common sense reconfiguration like Ashford Dunwoody/285 or Pleasant Hill/85. 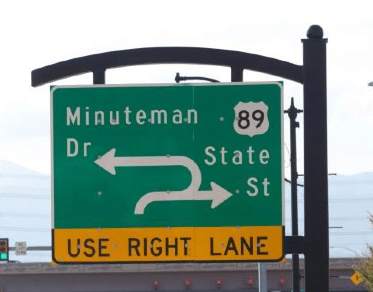 – this is complete re-routing that at night will cause accidents. PS when we signed up for “Johns Creek” I don’t think “progressive” thinking like this brainstorming was what most of us had in mind!!! Wow – I really thought this was a joke. So how would one control the thousands of cars that now need to make U-turns on 4 already crowded streets? So one U-turn lane could handle what 2 left turn lanes cannot? I think you would see increased accidents, deaths and marginal improvement (if any). I’m very surprised this is what someone came up with. Only solution to the Intersection at Medlock Bridge and State Bridge road is an underpass for thru traffic on one of the road. It will of course take long construction time, but will have a long lasting effect. 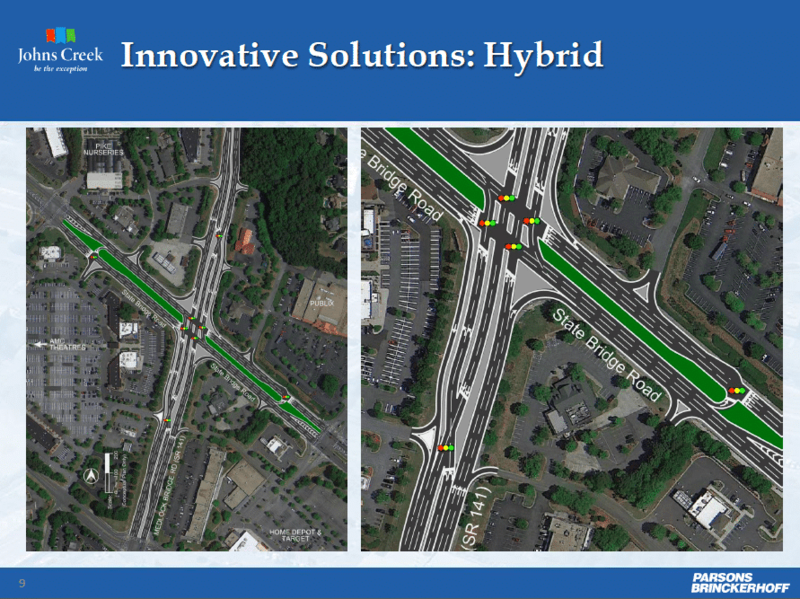 Did anyone study the impact of Buford Hwy/ Pleasant Hill solution? Let’s embrace this idea and start with the light at the Atlanta Athletic Club. If it works well there, we can expand it’s use. Or we can ask some of the neighborhoods that are already forced to make U-turns to travel north and south on 141 just how much they enjoy that today. Let’s do another study to come up with another bad idea… What’s this make? Ten in ten years? How about 2 more council members (to fill EMPTY seats) to provide additional ideas, as well as checks and balances. We have money for study after study, but no money for a special election? Really? WHAT a nightmare. And there’s a high school right there with a thousand new or fairly new drivers. By all means, let’s put in the most confusing mess we can think of and invite the Keystone Cops from last century to monitor it cuz Johns Creek’s finest will surely find another city in which to work. 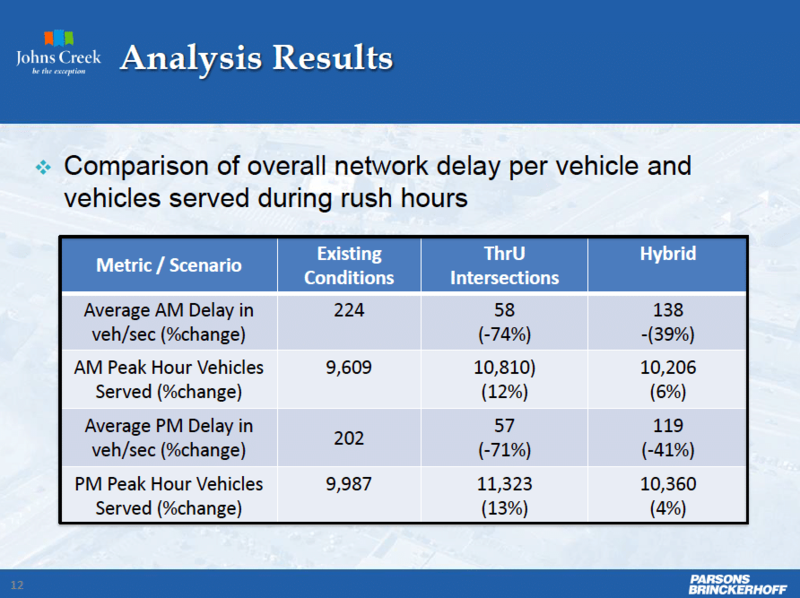 I am almost positive that the traffic volumes used in this project analysis were before the recent annual update by GDOT. 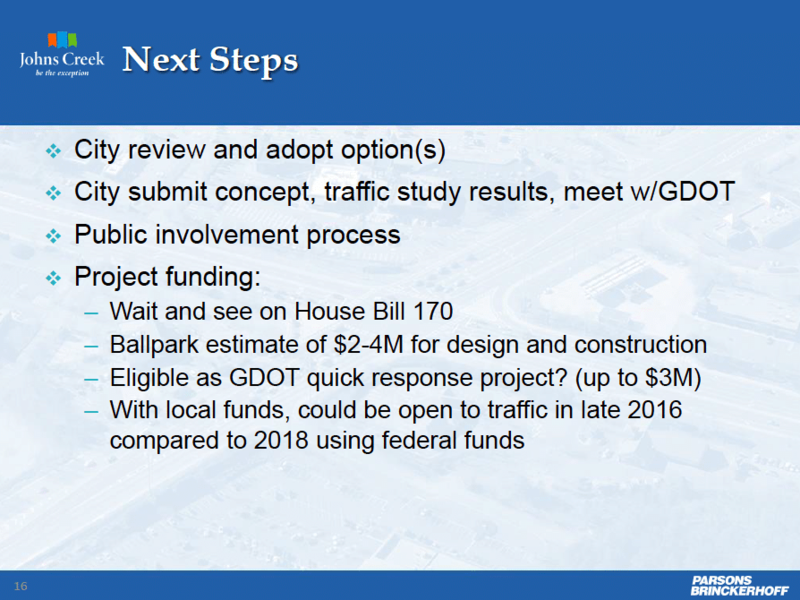 I believe I heard it stated (by gov personnel) that volumes on 141 had increased dramatically in the last year. By this, I mean more than 20k cars a day. That said, this plan is extremely questionable. The people most impacted and inconvenienced by this design will be the JC households making frequent local trips daily and not the huge volume of commuters passing through in the am/pm each day. Just think what it will be like to wait just to make the right and try to move over to the far left lanes in heavy traffic to get to the U-turn lane to wait in line again to get to the intersection. What is the projected impact on traffic accidents? This seems like a recipe for more accidents and not less. Again, the highest risk for accidents will be on JC citizens who will be the ones most often making lane changes across high volumes of traffic and merging continually to make a left. This is an absolute thumbs down for me. You can explore and see the traffic volumes for yourself at the link above. If you need assistance, email me.